Brushing your teeth may seem like a simple routine, but there’s still a magical feeling when your teeth become squeaky clean. 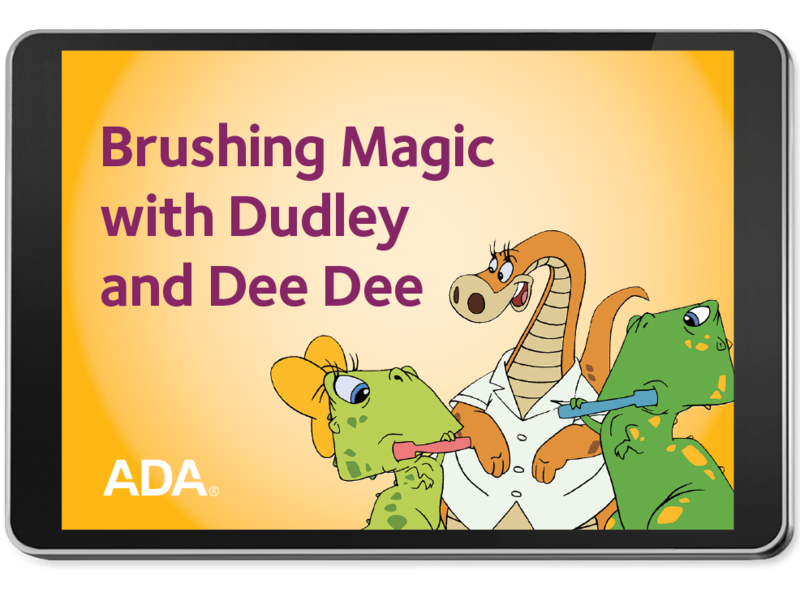 Inform your young patients about the “magic” of oral care with the ADA animated video Brushing Magic with Dudley and Dee Dee, featuring Dudley the Dinosaur. The video follows Dudley as he performs magic tricks, outlines the importance of healthy teeth, and provides valuable tips for keeping teeth clean. This animated video gives young patients an in-depth look at oral health, including what causes plaque, and equips them with knowledge of how to get rid of it. It also provides the perfect opportunity to educate them about brushing and flossing correctly, with Dudley using his “magic wand” to demonstrate. Each Dudley video you purchase is instantly accessible through your online ADA e-bookshelf. To learn more about the entire Toothflix video series, visit ADA.org/toothflix. Teach your young patients why and how to care for their teeth. Order your Brushing Magic with Dudley and Dee Dee – ADA streaming video today!